The Distant Reaches of space hold a planet whispered in tales to frighten children, to threaten criminals and sway tyrants. The horrible truth is that the planet is the last hope before all out war for entire species that struggle to coexist within the Hedonix empire: the planet wide arena of Hollow Cell. 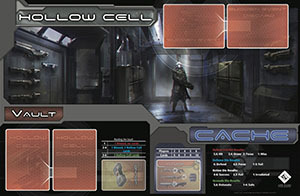 Hollow Cell is an easy to play, fast paced, arena game designed by Garret Herdter. Take up the challenge as one of 18 unique warrior races. Draw hands of hollow cell cards to either equip on your character or play to damage your opponent. Roll dice both in defense and attack while you dodge deadly planet wide events sent by the Hedonix watchers to speed up the match. Take cover in builds and raid forgotten caches of weapons and armor to best your opponents in an all out free-for-all battle where only the luckiest and the most skilled will survive to claim victory!